Lisa Spangler, whose style I adore, reports that she's a bit obsessed with gouache. After reading her gouache posts, and seeing all the cool stuff she's been making, I promptly went to the local art supply store and bought a few tubes. They were a bit more expensive than I anticipated, so I realized I needed to hold off before getting any more got a few more tubes from amazon. As much as I love to support brick and mortar stores, they were a LOT less at amazon. 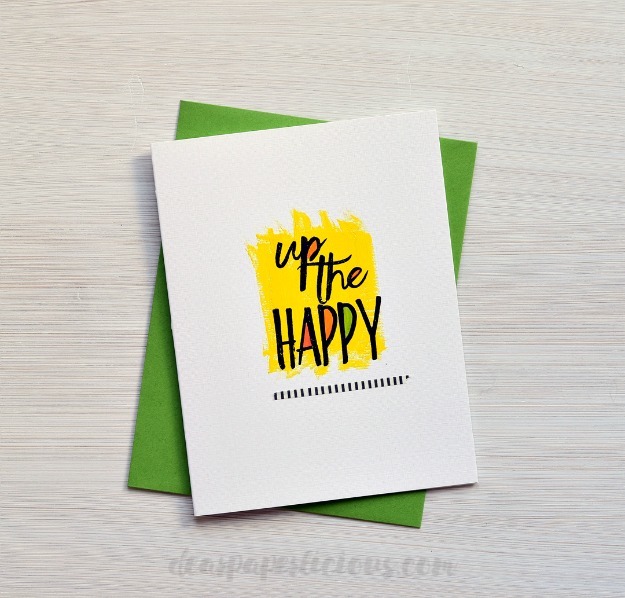 This linen cardstock works beautifully for this type of card because you can see the texture through the gouache and it easily holds up for a one layer card. No warping at all. Very easy to make. And unlike, most efforts, this came out exactly as I imagined first try. Truth!!! 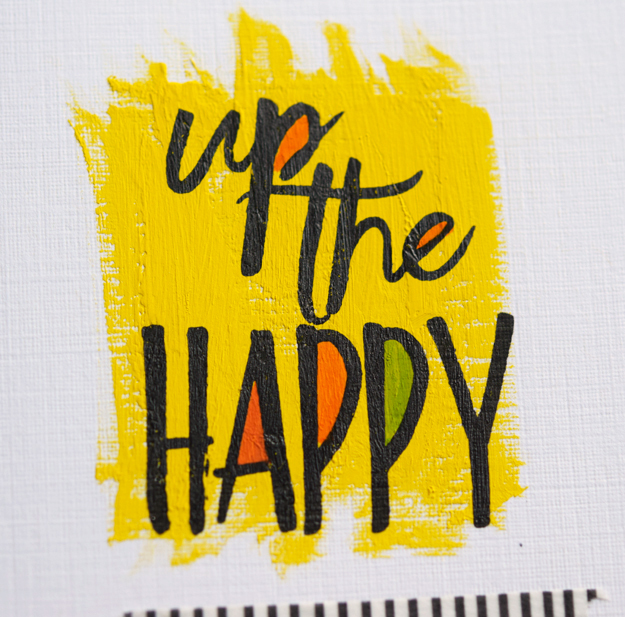 Select a big bold sentiment, such as this one from Up the Happy from Essentials by Ellen. Make an A2 card from white linen cardstock. Paint yellow gouache (I used Primary Yellow by Winsor & Newton) as shown with a dry brush so that it is a bit bigger than the sentiment. Let dry. This dried by the time I finished washing out the paint brush. Stamp sentiment. I used Versafine Onyx. Color insides of letters with Tombow markers. Needs something. Added a bit of this Little B washi tape. MOOD WHEN DONE = Ob$essed with gouache. Thanks, Lisa! Thanks to introducing me to another product I now *need* ... any idea if they carry it at the big box (i.e. coupon) stores? they should. It is a pretty common art supply. It would be in the paints section. thanks! what a fun card Joan - might have to give gouache a go!! Thanks Laurie, gouache can be layered. I didn't add any water and used a dry brush. In a couple of parts, I painted over and it did leave a bit of a layer. Try it! Sweet card! No wonder you were happy when done -- that bright yellow could lighten the mood of anything! Wow! Love all the bright happy!! Marcella Hawley swears by gouache. I wonder if you can ever have too many coloring mediums? Nah!